BROWNLOW medallist Nat Fyfe is hopeful he will play again in 2016 as he prepares to undergo surgery on a fractured leg in Melbourne. In the dramatic loss to Carlton on Sunday, Fyfe re-injured the leg he broke during last year's preliminary final, which has since contained a plate on the fibula bone. The superstar midfielder underwent scans to confirm the damage and will undergo surgery on his fibula from leading sports surgeon Julian Feller, who operated on Fyfe at the end of last season. "I'll know more after I see the surgeon tonight but I'm really hopeful I'll be able to get back and play some footy this year," Fyfe told Channel Seven at Melbourne airport on Monday. 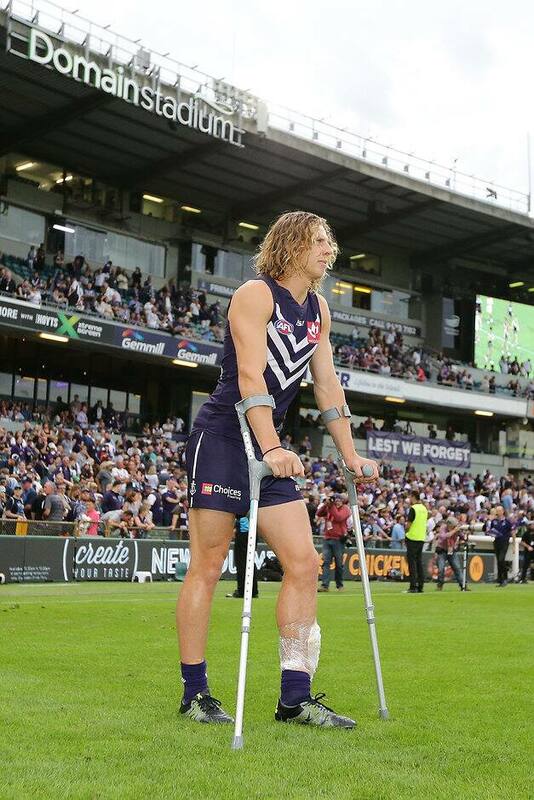 Fremantle stressed it would take a cautious approach to Fyfe's recovery and would not put a timeframe on his return. Coach Ross Lyon said the Dockers would keep Fyfe on the sidelines for the rest of the season if that was what it took to allow the 24-year-old to make a full recovery. "He has a fracture in his leg (and) he's flying to Melbourne. He'll be operated on," Lyon told Triple M radio in Melbourne. "There'll be no return date to play put out, it'll just be what's best for Nathan when he's 100 per cent. "We're not even interested in his return to play at the moment. If it took him a year to get healthy that's what we would do. "We'll leave it in the hands of the experts and then we'll update the market place and our members." The Dockers have also been hit with an injury to important defender Michael Johnson, who suffered a serious hamstring tear and medial ligament damage on Sunday. Johnson twisted his knee in the last quarter against the Blues but went back onto the ground after an initial assessment on the bench. Freo general manager of football operations Chris Bond said scans had confirmed that Johnson would also undergo surgery as a result of an injury suffered in Sunday’s game. “Michael suffered a hamstring tendon injury in his right leg and a tear to the medial ligament in his right knee,” he said. Fremantle is already missing ruckman Aaron Sandilands (ribs) and recruit Harley Bennell (calf) for extended periods, while captain David Mundy will return for next Saturday's clash against Adelaide at Adelaide Oval. Lyon conceded on Sunday night the Dockers were "re-stumping, re-plumbing, re-wiring", and repeated the line on Monday. After nine seasons in charge of teams with finals expectations, the coach said he wanted to be in charge of a rebuild. "I'd like to have a crack at it. I think I've got all the capabilities to get it done," he said. "I've always coached teams and clubs with massive expectation, I've been to three Grand Finals and a replay. "This club has won the second most amount of games behind Hawthorn over four years … I think we've tried to create opportunity and we've done that. "I didn't just think it was going to roll along like that forever." The Dockers' fall from grace has been the most dramatic in 2016, but it has occurred at the same time finals hopefuls Richmond (1-4) and Collingwood (1-3) have dropped into the bottom six. "I think there's three clubs … when you look around at the Pies today and Richmond, there's clubs not where they want to be," Lyon said. "All of us are assessing as we go on a weekly basis and adjusting the strategy and the plan." Lyon said he was having "continuous meetings" with the club's list management committee, CEO Steve Rosich and president Steve Harris about the team's direction. "Clearly we didn't think we'd be 0-5 with the personnel we had and what we were planning," he said. "But with injury and the reality of performance, it brings things forward and urgency of assessment."